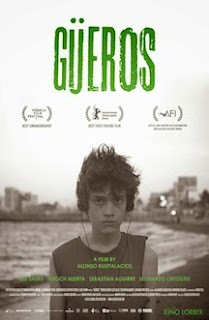 Movie Review: It’s impossible not to feel some empathy with “Gueros”, a very Mexican experience with a touch of the 60’s French New Wave from debutant director Alonso Ruiz Palacios. With a virtuous sense of humor, Palacios, who co-wrote with Gibrán Portela (“The Golden Dream”), addresses the student youth in Mexico City through the story of Fede (Tenoch Huerta), aka Sombra, a reclusive, depressed, and aimless university student, experiencing panic attacks, whose life will change completely after the unforeseen arrival of his younger brother, Tomas (Sebastian Aguirre). The latter, evincing an ebullient personality, soon starts complaining and yelling against the numbness of his brother who shares the filthy apartment with another slacker called Santos (Leonardo Ortizgris). When Tomas finds out that an old popular Mexican singer, Epigmenio Cruz, is hospitalized nearby, they decide to visit him, right after the drunken Sombra has been forcibly evacuated from home due to stealing electricity from a neighbor. The times are of protest and a big student strike movement is taking place in the university and often throughout the streets. The leader of this movement is Sombra’s girlfriend, Ana (Ilse Salas), who is persuaded to join the trio of boys in an adventurous trip. A trip whose distinct and uneven episodes try to mirror the state of today’s Mexico with its revolutions, pop culture, and socio-political problems – aspects that not always take the best course here but also never dismantle our interest. In particular occasions, like when the protagonists admit they’re in a film within the film, it seems that the story is going to turn into something different, an expectation that keeps us holding on. “Gueros” makes sure to show all these conjunctures but never bothers in confronting or exploring them further. Nevertheless, ambition and filmmaking ability is something that Palacios attested; it’s a pity he didn’t take more advantage of that.